On Saturday February 7th 2015 Four Writers, Nicholas Jose, Rodney Hall, Hannie Rayson and Neilma Sydney will be in conversation with Margaret Throsby at Four Winds (ticket details from Four Winds Office 02 6493 3414) and more information on page 17 of February edition of The Triangle. For those who may have missed the screening of this little film during the Olga Masters Festival, it will be shown on Saturday 7th of February at 7.30pm at the Cobargo School of Arts Hall. $10/$6 conc. The perfect ending of a literary day, Four Winds then the Cobargo School of Arts Hall! 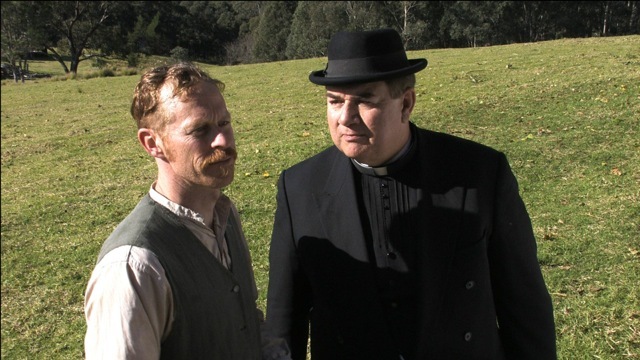 After a series of screenings around the district to great applause the film ‘The Mission Priest’ by Lee Chittick based on the Olga Master’s short story set in Cobargo in the 1930’s will again be screened in it’s home town Cobargo. We plan to turn the Cobargo Hall into a cinema for the event. The director of ‘The Mission Priest’ Lee Chittick is perusing options for the film by entering it in film festivals and seeking funds to turn it into a trilogy of three Olga Masters short stories, that would make it a full theatrical release trilogy! All set in Cobargo where so many of her short stories have been set. Olga Master’s is considered one of Australia’s great female writers. Looking forward to showing the film at it’s home Cobargo! This entry was posted in Author/Contributor, Four Winds, Well Thumbed Books. Bookmark the permalink.